Understanding drug addiction is a matter of understanding how nerves talk to one another. Nerve cells, called neurons, coounicate with electrical impulses called nerve impulses. A nerve impulse travels out from the nerve cell along a long extension called an axon. Eventually the impulse reaches the tip end of the axon, usually positioned very close to another neuron or to a muscle cell or gland. Axons, however, do not actually make direct contact with other neurons or with large tissue. Instead, a narrow gap, 10 to 20 nanometers across, separates the axon tip and the target neuron or tissue. This junction of an axon with another cell is called a synapse. 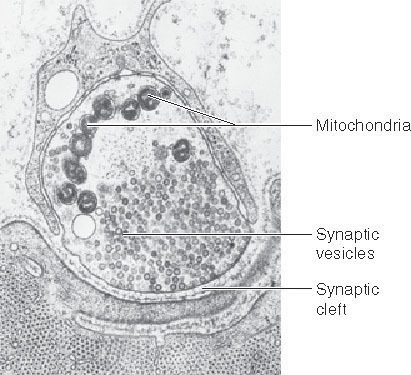 The membrane on the near (axon) side of the synapse is called the presynaptic membrane; the membrane on the far (receiving) side of the synapse is called the postsynaptic membrane (figure 1). Figure 1 A synapse between two neurons. 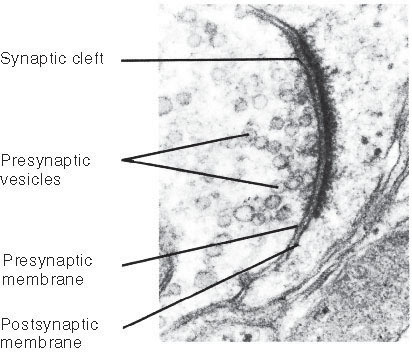 This micrograph clearly shows the space between the presynaptic and postsynaptic membranes, which is called the synaptic cleft. When a nerve impulse gets to the end of an axon, its message must cross the synapse if it is to continue. Messages do not jump across synapses. Instead, they are carried across by chemical messengers called neurotransmitters. These chemicals are packaged in tiny sacs, or vesicles, at the tip of the axon. When a nerve impulse arrives at the tip, it causes the sacs to release their contents into the synapse. The neurotransmitters diffuse across the synapse and bind to receptors in the membrane of the cell on the other side, passing the signal to that cell by causing special ion channels in the postsynaptic membrane to open (figure 2). Because these channels open when stimulated by a chemical (in this case, a neurotransmitter) they are said to be chemically gated. Why go to all this trouble? Why not just wire the neurons directly together? For the same reason that the wires of your house are not all connected but instead are separated by a host of switches. When you turn on one light switch, you dont want every light in the house to go on, the toaster to start heating, and the television to come on! If every neuron in your body were connected to every other neuron, it would be impossible to move your hand without moving every other part of your body at the same time. Synapses are the control switches of the nervous system. Figure 2 Events at the synapse. (a) When a nerve impulse reaches the end of an axon, it releases a neurotransmitter into the synaptic space. The neurotransmitter molecules diffuse across the synapse and bind to receptors on the postsynaptic cell, a neuron in this case, passing the signal to that cell. 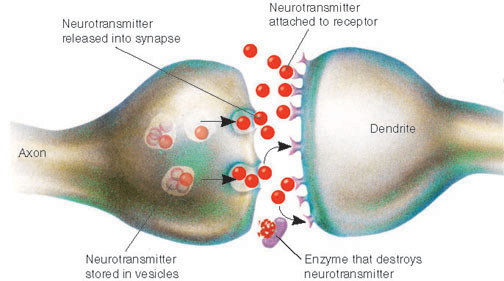 Enzymes destroy the neurotransmitter molecules to prevent continuous stimulation of the postsynaptic cell. (b) A transmission electron micrograph of the tip of an axon filled with synaptic vesicles. The vertebrate nervous system uses dozens of different kinds of neurotransmitters, each recognized by specific receptors on receiving cells. They fall into two classes, depending on whether they excite or inhibit passage across the synapse. In an excitatory synapse, the receptor protein is a chemically gated sodium channel, meaning that a sodium channel through the membrane is opened by a chemical, the neurotransmitter. On binding with a neurotransmitter whose shape fits it, the sodium channel opens, allowing sodium ions to flood inward. If enough sodium ion channels are opened by neurotransmitters, an action potential begins. In an inhibitory synapse, the receptor protein is a chemically gated potassium channel. Binding with its neurotransmitter opens the potassium channel, leading to the exit of positively charged potassium ions and a more negative interior in the receiving cell. This inhibits the start of an action potential, because the negative voltage change inside means that even more sodium ion channels must be opened to get a domino effect started among voltage-gated sodium channels, and so start an action potential. 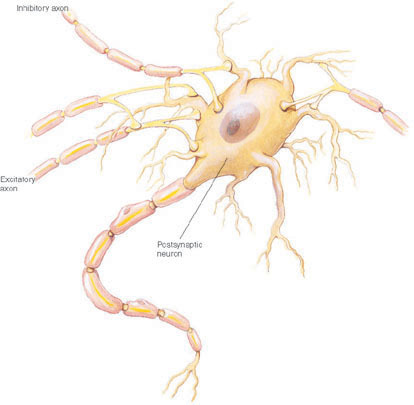 An individual nerve cell can possess both kinds of synaptic connections to other nerve cells. When signals from both excitatory and inhibitory synapses reach the body of a neuron, the excitatory effects (which cause less internal negative charge) and the inhibitory effects (which cause more internal negative charge) interact with one another. The result is a process of integration in which the various excitatory and inhibitory electrical effects tend to cancel or reinforce one another (figure 3). Neurons often receive many inputs. A single motor neuron in the spinal cord may have as many as 50,000 synapses on it! A synapse is a junction of an axon with another cell, a gap across which neurotransmitters carry a signal either facilitating or inhibiting transmission of a signal, depending on which ion channels they open. (a) Many different axons synapse with the cell body of the postsynaptic neuron illustrated here. The summed influence of their input determines whether or not an action potential will be realized and a nerve impulse will be sent down the axon extending below. 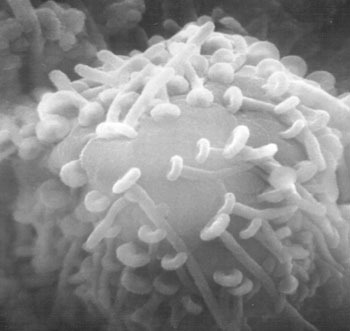 (b) Micrograph of a neuronal cell body with numerous synapses.